Preheat an oven to 350 degrees Fahrenheit and spray a 12-cup muffin tin with oil. Toast amaranth on the stove top over medium heat, stirring the grains until they turn a light golden brown and start to pop a bit. Remove from heat and set aside. 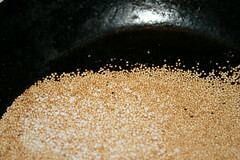 Variation: I have substituted uncooked quinoa for the amaranth, toasting it on the stove top, with interesting results. 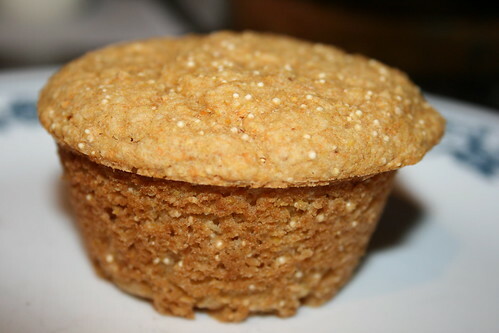 You can also omit this step completely if you don't want such fancy, grain-enhanced muffins. Once liquid ingredients are thoroughly mixed, pour contents of blender or bowl into dry ingredients and mix just until dry ingredients are incorporated into the batter. Variation: For a sweeter muffin, you might want to adjust the apple-juice-to-maple-syrup ratio: half cup of apple juice (or water! ), half cup of maple syrup. Distribute the batter equally among the 12 muffin cups. (I use an ice-cream scoop to do this.) Put the muffin tin into the oven immediately and bake for 20-25 minutes. 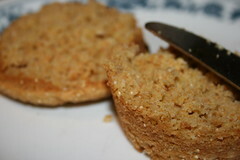 Remove muffins from oven and allow to sit for 10 minutes or so. Run a knife around the edges and pull muffins from the tin. These are great with Earth Balance, agave nectar (assuming you didn't opt for the full-maple variation), or hearty bean-based soups.